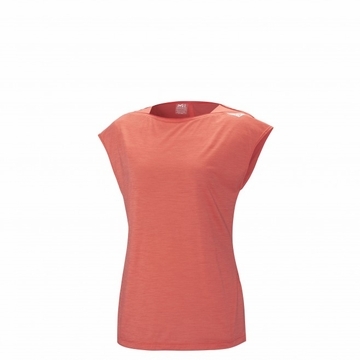 "Behind its casual, ultra-feminine style lies a technical tee engineered for the dedicated comfort of active women in the mountains. With a super-light hybrid build in LIGHT WOOL BLEND (merino wool/po lyester), the LD CLOUD PEAK WOOL TS SS is incomparably soft and smooth on the skin during alpine activity. Wool - fully thermoregulating and naturally anti-bacterial - provides ideal thermal stability in the mountains and anti-odor comfort. Added polyester increases its strength and wicking speed, to shorten drying time. For daily wear, an original easy-going package that's up for every adventure.